Framed oil painting: William Wollaston (1730-1797) by Thomas Gainsborough (1727-1788), oil on canvas c.1759. On long-term loan from a private collection. Gainsborough trained in London then returned to his native Suffolk. This is his first full-length portrait and represents the climax of his career in Ipswich. On the eve of his move to Bath, Gainsborough already shows his remarkable skill at combining figures and landscape. The textures of trees, clouds, woollen cloth and the curly fur of the spaniel are lovingly painted. 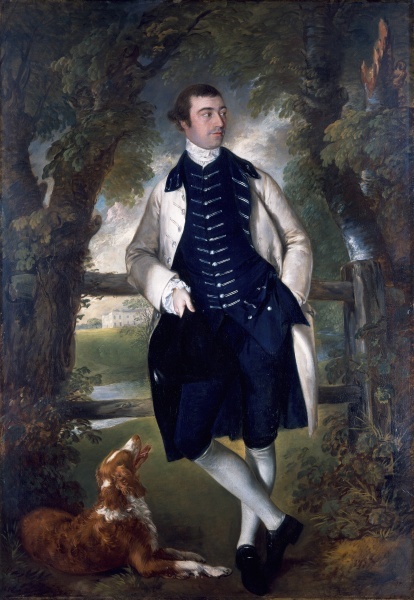 William Wollaston was later MP for Ipswich. He owned Finborough Hall near Stowmarket, seen in the background.